Owning an iron with an auto shut off feature is absolutely essential, but not all steam irons come with this safety feature. If you are ironing expensive clothes and want to stay on the safe side, then make sure you choose to buy an iron with auto shut off. This will prevent any unwanted over heating and potential burning of your garments. The last thing anyone wants to see after attempting to de-wrinkle their clothes for an important day is a burn mark! Not only does this feature protect your clothes, but it also happens to be a great safety feature for preventing fires in general. Some older steam irons that don’t have the automatic shut-off capabilities can actually start a fire in your house. This is best avoided at all costs, even if it means investing in a new up to date iron. Lets take a look at some of the best auto shut off irons from top brands, that are on the market today. 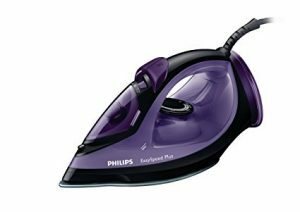 Not only is the Philips GC4521/87 Azur a top seller, top performing and easy to use iron, but it also comes with the auto shut off feature. This iron is a great all around iron in almost all aspects, as well as price. The Azur has a nice long cable allowing you to be mobile as you swing around your ironing board while you tackle creases. It’s also designed for speed, if your rushing out in the morning and forgot to iron the night before then the Azur is your best bet for a quick job. Philips has optimised the speed by regulating the amount of steam produced to un-wrinkle your clothes fast. If your looking for best bang for your buck make sure you take a good look at this model. The Azur is known for creating beautifully ironed clothes, it also works very quickly and has a couple extra luxury features like its quick heat up and drip stop system. The Azur is designed to keep you clothes in tip top shape, insuring you look your best every single day. Click here for specs, reviews, and current pricing. The Steamglide also has the auto shut off feature, along with a whole slew of other useful features, thus why it has made our top picks. Russel Hobbs has implanted some pretty useful functionality into this steamer. The water tank is adequate in size, not overly large, keeping the weight to a minimum. The ceramic soleplate is high quality, and provides a very smooth ironing experience on a variety of clothes materials. The soleplate also distributes heat evenly which contributes to it’s safety. The build quality and mechanics is excellent, which is to be expected from a brand name like Russel Hobbs. If auto shut off is a priority for you, along with many other benefits, then this iron is a great choice. Coming in at no. 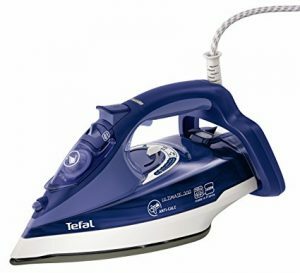 3 on our top auto shut off irons list is the Tefal FV9630. This is a pretty basic looking iron, but it has been designed with safety first in mind. The FV9630 has a unique soleplate shape, which is kind of pointed at the tip, allowing it to glide over wrinkles very easily. The front of the iron is also enlarged to allow for easy quick refilling. 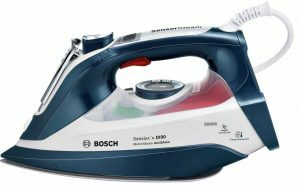 This iron also runs on 2600 watts of power, not the strongest we have seen but still adequate enough for a 200 gram shot of steam when the ironing gets challenging. The auto shut off is coupled with a stable, flat shaped back end, to allow the iron to sit up right and avoid any excessive over heating and touching of your garments or ironing board. 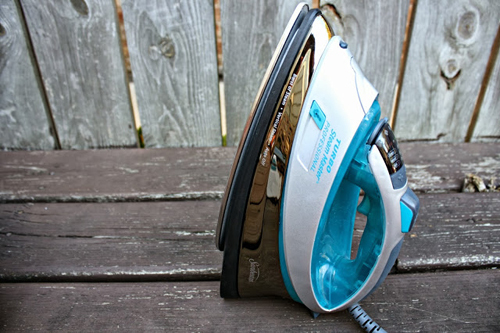 This is a great all-around home iron, as its simple to use and built quite durable. 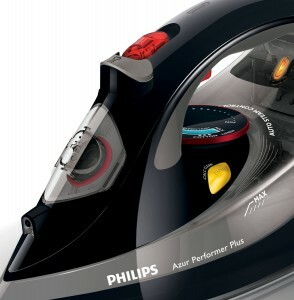 One of the stronger models of steam irons is the Philips Easyspeed. It’s a good idea they implemented to auto shut off feature to cool down this powerful steaming machine. The Easyspeed creates 35 grams of non-stop steam per minute, just while running in regular mode. If this isn’t enough then you can blast out 120 grams of steam for serious penetration power to flatten those creases. 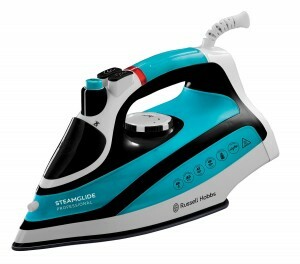 It’s a family safe iron but also comes with the stock essential features such as vertical steam, a smooth ceramic baseplate, an internal cleaning system, and an ultra fast heat up time of 2 minutes max. It’s also available at a very attractive price point. If the above irons don’t appeal to you then this one might. Before I get started I will say that this iron doesn’t have auto shut off, but actually something even more advanced. The TDI90GB Anti-Shine has a fantastic feature called iTemp. What iTemp does is it controls the overall maximum temperature that this iron can reach, and insures that it does not reach a dangerous temperature. You don’t actually have to control the heat on this model, or fiddle with any settings. Its a one temperature does all iron, making it probably one of the safest irons available on our best auto shut off irons list. This iron has it all, but also comes at a slightly steeper price.